Big Data, Bioinformatics, & PM Disrupt. Slone Partners Understands. Patients, through technology and fascinating new diagnostic tools, are taking increasing control of their own bodies and destinies. Personalized medicine is here to stay, forever changing the relationships between patients, physicians, healthcare companies, and payers. Seismic shifts abound, like 23andMe genetic testing kits appearing in family living rooms, a mouth swab the conduit to examining individual DNA which scientifically affirms disease predisposition and ancestral health issues. The Apple Watch now acts as host to KardiaBand, the first FDA-approved EKG monitor / wearable that spots irregular heart activity that AliveCor – the band’s maker – monitors remotely on a subscription model. In both cases, regular people plan for, and attempt to prevent, life-threatening problems through data. Corporate America acutely realizes the positive benefits of healthier employees, and those employees being actively engaged in preventive measures. Non-smoking mandates, onsite gyms, and fitness financial bonuses keep employees healthy, incentivized, and productive. But some leading companies have gone much further. Apple recently announced the imminent opening of employee-only health clinics, while the trifecta of Amazon, JP Morgan Chase, and Berkshire Hathaway have teamed up, using technology to internalize the administration and implementation of healthcare for hundreds of thousands of employees to cut costs and streamline processes. 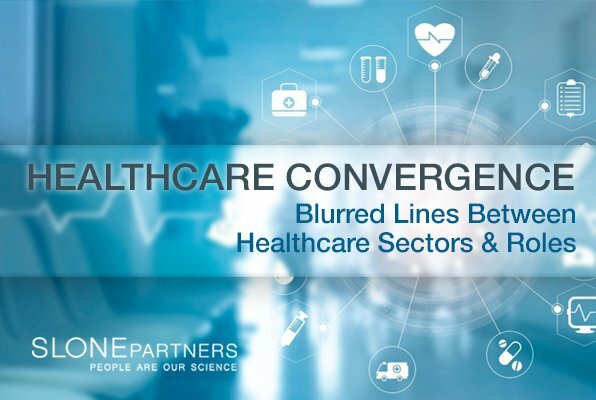 These waves of personalization and customization are creating blurred lines between life sciences, diagnostics, pharmaceutical, hospital systems, doctors, and insurance companies, as they seemingly converge. Former B2B healthcare companies are morphing into consumer-facing services companies that must now deliver experiences and manage relationships like traditional retailers. Technology has disrupted healthcare in ways unimaginable just 15 years ago before smart phones and smart wearables exploded in popularity. Logically, this transformation is causing all healthcare industry players to adopt more consumer-centric, patient-centric approaches which in turn fundamentally changes the composition of senior management and workforces. Directors of Marketing with consumer marketing experience but without healthcare experience are becoming more sought after. C-suite executives with retail distribution backgrounds are now joining science-based companies. Industrial designers are being onboarded by wearables companies to design beautiful and intuitive lifestyle devices and interfaces. And technologists, coders, data miners, and artificial intelligence specialists are in steady exodus from pure-play tech companies like Google, Microsoft and Facebook to join healthcare companies after previously shunning the industry as uncool. Salaries for this talent are on the rise. Healthcare is suddenly cool again, driven by consumers empowered by, of all things, information – information formerly tucked away in physical manila folders at physician practices, but now digitally flies around deep sea fiber optic cables and wireless networks, and satellites. This data leaves companies scrambling to harness, examine and create products addressing the phenomenon. At Slone Partners, People Are Our Science™. Shoulder to shoulder, we help the most innovative healthcare companies identify and place exceptionally impactful leadership who make both business and breakthroughs happen. In our everyday client relationships, we see the breathtaking, disruptive changes taking place because of technology and the impact it’s having on building background-diverse workforces. It’s wondrous to be part of these revolutionary processes.